Baku's "Ichari Shahar" (literally, Inner City), often referred to by foreigners as the "Old City", is a unique architectural preserve that differs considerably from the other ancient cities of Azerbaijan. Ichari Shahar [pronounced ee-char-EE sha-HAR] has many fascinating architectural monuments, including the Maiden's Tower and the Shirvanshah Palace, which is currently undergoing reconstruction. But more than this, the medieval Inner City used to have its own distinct culture and set of traditions, many of which are starting to be lost and forgotten. Reconstructing the ethnographic features of the community that once lived behind Ichari Shahar's fortified walls is difficult. Most of today's Azerbaijanis know very little about the history and traditions of the Inner City. As the older generation passes on, fewer and fewer people know firsthand about Ichari Shahar's unique traditions, way of life, national clothing, holidays, tales and anecdotes. Today, it would be a fair assessment to say that the Inner City's original community hardly exists. Many of the local residents have sold their homes and moved elsewhere in Baku and many foreign companies have located their offices there. Here historian Farid Alakbarov gives us a feel for what life was once like in the vanishing community of Ichari Shahar. His research and insight comes from sources he has discovered at Baku's Institute of Manuscripts and from his own experiences of growing up in the Inner City. 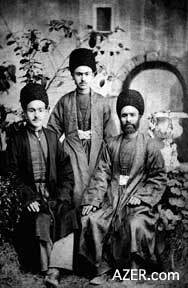 Left: The author's great grandfather, Mashadi Baghir Alakbarov (bearded), with his two sons, the author's grandfather Abdul Manaf Alakbarov (center) and Museyib (left) in their garden in Ichari Shahar. All were sea captains. Abdul Manaf graduated from the higher Naval School in St. Petersburg. The photo was taken in 1885. I was born and raised in Baku's Inner City, in a house in which previously three generations of my family had lived. Ever since childhood, I have heard fascinating stories about Ichari Shahar from my older relatives, my grandfathers and especially my grandmothers - Hadija Kazimova, my mother's mother, granddaughter of the famous "Gatir" Zeynalabdin, and Ruhsara Babazade, my father's mother. Later I began to collect stories and study various sources related to the history of the Inner City such as "Old Baku", a book by the distinguished Azerbaijani actor Huseingulu Sarabski (1879-1945). Sarabski, who was born in Ichari Shahar and lived there for many years, wrote vivid descriptions of the events he witnessed there. Likewise, the book "What I Saw, What I Read, What I Heard" by the late writer Manaf Suleymanov (1913-2001) [published in Azeri Latin in 1996 by Azerbaijan Publishing House] contains valuable information about the Inner City. Interesting facts may also be gleaned from the historical works, chronicles, newspapers and documents archived at Baku's Institute of Manuscripts. According to the archeological evidence, the city of Baku dates back to at least the early centuries AD. After 1538, Baku served as the capital of the khanate of Shirvanshah after Shamakhi, a city 1.5 hours north of Baku, sustained a major earthquake. That's when the Shirvan Shahs moved their capital to Baku. From 1747 to 1806, Baku was the capital of a khanate that included Baku itself and 39 neighboring villages. This independent principality was called "Badkube" (i.e. wind-beaten), "City of Winds", and coined its own money. Left: The Mollakhana, the only schools that existed in the Old City of Baku prior to the establishment of Russian schools. Youth were beaten (see print) when they failed at memorizing the Koran, which was in Arabic, a language that they did not know. During this period, the entire city was located inside the fortress walls and had a population of approximately 7,000 people. After the Russians occupied the city in 1806, and especially during the first Oil Boom of 1850-1920, Baku grew rapidly beyond its fortified walls. This is when the expressions "Ichari Shahar" (Inner City) and "Bayir Shahar" (Outer City) first came into use. Huseingulu Sarabski writes: "Baku was divided into two sections: Ichari Shahar and Bayir Shahar. The Inner City was the main part. Those who lived in the Inner City were considered natives of Baku. They were in close proximity to everything: the bazaar, craftsmen's workshops and mosques. There was even a church there, as well as a military barracks built during the Russian occupation." Residents who lived inside the walls considered themselves to be superior to those outside and often referred to them as the "barefooted people of the Outer City." The Inner City consists of many small sections that are demarcated by winding lanes and narrow streets. Originally, each section, or block, was named after a neighboring mosque: Juma Mosque Block, Shal Mosque Block, Mohammadyar Mosque Block, Haji Gayib Mosque Block, Siniggala Mosque Block, Gasimbey Mosque Block and so forth. Some of the sections of the Inner City and their mosques were named after the clans and nationalities that lived there. For instance, Gilaklar was the place where the merchants from Gilan stayed; Lezgilar was the street where the Dagestani armorers and gunsmiths lived. Most of the Inner City's residents were craftsmen, merchants or seamen. Some of the sections took their names from certain professions, such as Hamamchilar (Bathhouse Owners), Bazarlar (Cloth Traders) and Hakkakchilar (Stone Engravers). Back in 1806, there were 707 shops and craftsmen workshops in the city, even though the total population was only 7,000. Every merchant and skilled craftsman had his own store. Their customers were the traders who came to Baku from various countries. Baku ships carried goods to and from Iran, Central Asia and Russia. The Inner City's ancient monuments include the Maiden Tower, the Sinig Gala Minaret (11th century), the fortress walls and towers (11th and 12th century) and the Shirvanshah Palace (15th-16th century). In addition, the Inner City once boasted 28 mosques, nine caravanserais, several bathhouses, potable water reservoirs (ovdans) and a bazaar. Merchants from Central Asia tended to stay in the 16th-century Bukhari caravanserai, while the Indian traders preferred the 15th-century Multani caravanserai. The residents of Baku were fond of bathhouses. Besides a bath, one could get a massage, enjoy some refreshments like cool sharbat (fruit drinks) or hot tea, have a snack or smoke the hookah pipe there. 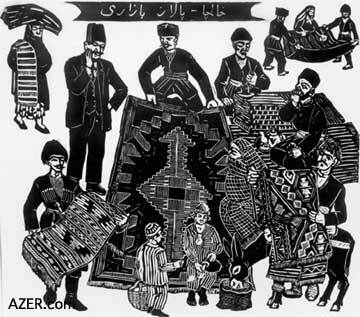 Left: The Carpet Bazaar-bringing to market, displaying and selling. Note women covered by veil. Several of Baku's bathhouses are still standing, including the large 15th-century Haji Gayib bathhouse behind the Maiden's Tower and the 17th-century Gasimbey bathhouse near the Cultural Department of the British Council. While Baku's medieval bazaar no longer exists, you can still see its columns and arches behind the Maiden's Tower. In the early 20th century, the bazaar was enlarged to extend from the Multani and Bukhari caravanserais to the 14th-century Juma Mosque. After the Russian government took control of Baku in the early 19th century, the traditional architectural look of the Inner City changed. Many beautiful European - type buildings were constructed during the 19th century and early 20th century, using styles such as Baroque and Gothic. One such building, formerly known as the "Chain House", houses Baku's Institute of Ethnography today. This building's roof used to have three classical Greek - style statues of women on display along with two freestanding vases. The pedestals of all of the statues and vases were joined to each other with a double iron chain, thus giving rise to the name "Zanjirli Ev" (Chain House). When I was a child, I used to hear the older Inner City residents refer to this building as the "Chain House", but this expression is no longer used today. In the Soviet period, all of the building's statues were removed, as were the vases. However, the central statue has recently been reconstructed. To the left of the Chain House, as you walk in from the Double Gates, stands a three - story, early modern style house which was built in 1903 by my great - grandfather, sea captain Mashadi Baghir Alakbarov. He lived on the third floor. His brother Museyib, also a sea captain, lived on the second floor. Mammad Sadikh Alakbarov, who worked at a bank, lived on the first floor. The attached one - story building, now covered with grapevines, also belonged to them and was leased to various shopkeepers. Left: Traditional Funeral service in the Old City. Molla on rooftop calls to prayer. Inner City businessman Gatir Zeynalabdin Taghiyev (1837-1915), my mother's great-grandfather (not to be confused with Taghiyev, the famous millionaire), built a beautiful two-story Baroque-style building to the right of the Chain House. Unfortunately, that building was torn down in the 1970s and replaced by a Soviet concrete block structure that is known as the Encyclopedia Building. Sarabski provides interesting information about the history of the Baku fortress gates, which were built between the 12th and 19th centuries. In the 1930s he wrote: "Recently the Inner City has acquired a fifth gate, though in the past there were only four. The most famous of the entrances is the Double Fortress Gates [Gosha Gala], which was sometimes referred to as the Shamakhi Gate." According to my elderly relatives, in the past there was only a single archway there at Gosha Gala, not the two entrances that exist today, which allow traffic to enter and exit through separate archways. It seems that Russian General Tsitsianov was set on capturing the Inner City of Baku through the Gosha Gala gates. In 1806, the Russian navy landed its troops on the shores of Baku. General Tsitsianov sought permission from Khan Huseingulu to permit a garrison of 600 to 1,000 Russian soldiers to enter the city, under the command of Russian authorities. At first, the khan agreed and even went out to greet Tsitsianov in front of the Double Fortress Gates. But while the negotiations were being carried out (February 2), the khan's cousin Ibrahim suddenly shot Tsitsianov. Tsitsianov's soldiers fled. The khan's guard tracked down the Russians and killed many of them. Then the Baku artillery opened fire on the Czar's ships, which made a hasty retreat to Sara Island, off the coast of Baku. The khan beheaded Tsitsianov and then sent his head to the Iranian ruler Fathali Shah as a gift. Since Russia was at war with Iran, Huseingulu khan hoped to engage the Shah's assistance in helping him combat the Czar's army. However, Fathali Shah did not offer any help. Seven months later, on September 18, 1806, the Russians returned and this time easily captured Baku. With his 500 soldiers and 70 cannon, the khan could not withstand the superior Russian forces under Bulgakov. Huseingulu fled to Ardabil, a city in what is now Southern Azerbaijan (part of Iran). Left: The Zorkhana-a type of traditional sports club for men. Wrestling was accompanied by music played on drums, zurna and balaban. Revolution in 1920, this monument was dismantled and destroyed because it honored the Czar's army. During the Soviet period, Azerbaijani historians avoided mentioning these facts and did not include the Tsitsianov incident in the "official" version of the history of Azerbaijan. I happened upon this information by reading some of the old chronicles that are maintained at Baku's Institute of Manuscripts, especially a chapter called "The History of the Baku Khanate," found in the book "Gullistani-Iram (Garden of Paradise) by the famous scholar Abbasgulu Agha Bakikhanov (1794-1847), himself a descendant of that last Baku khan. Sarabski provides interesting information about another famous gate called the Taghiyev Gate [located near what is now the Academy of Science Presidium]. He writes: "Another gate is situated close to the Double Fortress Gates, near the Sabir Square." This gate is not medieval and was built much later (1877) by the Baku merchant and landowner Haji Zeynalabdin Taghiyev [a namesake of the famous millionaire], who had the nickname Gatir Haji Zeynalabdin. Actually, his nickname relates to this gate. Haji Zeynalabdin owned various shops where the Sabir Garden and Husi Hajiyev Street are today, just outside the fortress walls. However, nobody wanted to rent these shops as they were considered too far on foot from the bazaar in the Inner City, even though they are part of the heart of the city today. For quite a long time, Haji's stores remained empty. Finally, he came up with an idea to ask permission from the Baku City Council to open a section of the citadel wall and erect a new gate there. Left:"Novruz Bayrami sweets" for the New Year (March 21) from the series of prints by Alakbar Rezaguliyev called "Old Baku", 1966. Here women prepare baklava and shakarbura. Sarabski cites very brief information about the other Inner City gates. The third gate opened into the courtyard of the Industrial College [now, Azerbaijan State Economic University]. Wheat and coal were brought from the Absheron village of Navahi and various mountain villages in carts and camel caravans and then sold there. The fourth gate was situated behind Baku's City Hall. The fifth gate opened from the Governor's Garden near the present-day Philharmonic Hall. The native Inner City dwellers belonged to several different clans, some of which had very humorous names. For example, some of the more influential clans were named: Agshalvarlilar (those [men] who wear white trousers), Toyugyeyanlar (chicken-eaters), Toyugyemayanlar (those who don't eat chicken) and Bozbashlilar (literally, the gray-headed, implying bald headed). Each clan often made disparaging jokes about other clans. My grandmother used to tell me jokes about the "Bozbashlilar". The word "bozbash" in Azeri also refers to a favorite Azerbaijani dish, a soup with large meatballs, chickpeas and sour plums. So, a very fat person from the Bozbashlilar clan might jokingly be called "the meatball from Bozbash." A person with a sour disposition might be known as "the sour plum from Bozbash." A very small person might be called "the chickpea from Bozbash." These days, the tradition of dividing residents into clans has disappeared in Ichari Shahar. Many young people don't even know which clan their grandparents belonged to. In the past, it seems everyone who lived in Ichari Shahar had a nickname. Often the names were quite humorous. For example, at one time there were five men living in Baku by the name of Haji Zeynalabdin. They all went by different nicknames. My grandmother identified them as: (1) Malakesh (Plasterer), (2) Gatir (Clever and Stubborn), (3) Spasibo (Thank You, in Russian), (4) Nokar (Servant) and (5) Pendiryemeyen (Cheese-Hater). The millionaire philanthropist Haji Zeynalabdin Taghiyev got his nickname, "Plasterer" because as a youth he had worked as a common day laborer doing masonry work. Supposedly, one day Taghiyev discovered a clay jar filled with golden coins plastered into the wall of an old house. He took the gold coins and sold them, and bought a piece of land that, luckily for him, had an oil gusher. So, the people nicknamed him Malakesh (Plasterer). However, Taghiyev himself denied that there was any truth to this tale. Another Haji Zeynalabdin Taghiyev was nicknamed "Gatir" (Mule) because he was so smart and persistent in building the Taghiyev Gate in the citadel wall. Mules are believed to be so intelligent that they can find water anywhere, even in the desert. Any person who can make money from "nothing" is often nicknamed Gatir (Mule). Writer Manaf Suleymanov tells a curious story about "Gatir" Haji Zeynalabdin. Haji had a merchant friend who was having trouble selling a large supply of biscuits (cookies). Haji took a box of the biscuits and hid his expensive ring inside the box (another version of the story says it was a five-ruble coin). Then, he went to the cafe in the Tabriz Hotel, opened the box and began to munch on the biscuits. Suddenly, he exclaimed: "Look, what I've found inside the box!" showing off the ring (or coin) to the people there. People rushed out to buy the biscuits immediately, and Haji's friend made a huge profit. The third Haji Zeynalabdin was named "Spasibo" ("Thank You" in the Russian language). As the story goes, this merchant found out that Czar Alexander III was planning to visit Baku. Zeynalabdin decided to play up to him in hopes of receiving a title, post or medal. Before the Czar arrived, Zeynalabdin repaired the Russian military barracks in the Inner City with his own money. The Czar visited the barracks, and afterwards met with the merchant and told him in Russian, "Spasibo, Zeynalabdin!" (Thank you, Zeynalabdin!) Then the Czar turned and left, without bestowing either medal or title. Zeynalabdin had spent enormous sums of money, but all he got was "Spasibo!" in return! From then on, Manaf Suleymanov writes, the people living in Ichari Shahar nicknamed him "Spasibo" Zeynalabdin. The elderly residents of the Inner City told me that there was yet another Haji Zeynalabdin who had once been a servant of the oil baron Haji Zeynalabdin. Gradually, he established his own business and became wealthy, too. Despite his wealth and newfound status, the people of the Inner City continued to call him Nokar Zeynalabdin (Servant Zeynalabdin). Historical records indicate that a madrasa [a religious secondary school] was set up in Ichari Shahar in the 11th century. It was there that the famous Eastern philosopher Baba Kuhi Bakuvi (933-1074) taught science. Four hundred years later, another distinguished scholar named Seyid Yahya Bakuvi (died in 1403) founded a Darul-Funun (university) in the Shirvanshah Palace. However, when the Shirvanshah state collapsed in 1538 and Baku lost its status as a capital, these higher-level schools were closed and the cultural life of the city gradually diminished. The tiny Baku khanate founded in 1744 could not replicate this sophisticated cultural environment of an earlier era. When the Russians descended on Baku in 1806, there were a total of 12 preliminary and secondary religious schools (maktabs and madrasas) in the Inner City. According to Sarabski, by the early 1900s, only three remained, and the quality of education had deteriorated. The common people called these schools "Mollakhana", meaning "Molla's Home". Some people did not want to send their boys to the Mollakhana, even for their preliminary education. They preferred to send them to the less expensive "private Mollas", who taught only the Arabic alphabet and the Koran. Education at the Mollakhanas was based completely upon memorization. When the youth could not pronounce the Arabic words, they were beaten with a stick called a "chubug" until they mastered the pronunciation. Likewise, during the calligraphy lessons, the teacher would hit the children's fingers when they did not write correctly. Parents typically supported this approach. When parents took their sons to the Mollakhana, they used to tell the Molla: "The flesh is yours, but the bones are mine!" meaning, "You can beat him, but don't break his bones." This expression has become an Azerbaijani proverb. In those times, flogging pupils was common, not only for the Muslim Mollakhanas, but for the Russian schools as well. Punishment was considered to be the normal way to make children learn and obey. 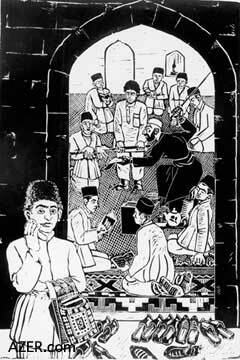 Before the Russians came, it was the Mollakhanas who provided the only education that was available in Baku. Young boys studied the Arabic alphabet, calligraphy, grammar and arithmetic, and had to memorize the Koran by heart. Sometimes, they read verses by Saadi and Hafiz in Persian, and were exposed to a bit of history from the small tome "Tarikhi-Nadir" (History of Shah Nadir) and a few other sources. The musical comedy "O Olmasin, Bu Olsun", (If Not That One (Bride), Then This One) composed by Uzeyir Hajibeyov in 1911, provides a humorous reference to this book, "Tarikhi-Nadir". One of the musical's comic characters, the merchant Mashadi Ibad, comments on how his friend has sprinkled his conversation with pretentious words and phrases in Turkish, Russian and French. "I've read nearly half of 'Tarikhi-Nadir'," Mashadi Ibad says, "but I still can't understand what you're trying to say!" The fact that this history text is so small makes the statement even more humorous. Beginning in the 11th century, the Inner City had three underground water supply systems built of stone and clay pipe. In the 19th century, this underground pipeline was named Naghi Kuhulu, meaning "The Pipeline of Naghi"; it served the Inner City residents until the beginning of the 20th century. The water flowed in from wells and springs situated throughout the city, then collected in a special reservoir inside a building named Shirin Ovdan (Sweet Water House), located near the Shirvanshah Palace. Sarabski writes that sometimes the pipes of the Ovdan clogged up, stopping the flow of water. A very kind, skilled person named Jumru Aghamali always came to the rescue. He was very small, slender and quick, and could descend into the narrow water pipe and clean it out. Sarabski writes: "Jumru Aghamali never asked for any payment for this work as he believed it was pleasing to God. After Jumru died, nobody continued his work and the Shirin Ovdan fell into disuse." Despite Jumru's generosity, he was still labeled with the nickname "Hezar pesha, kam maya", which means, "a thousand jobs, little money". Many families tried to find solutions to the city's water problem by digging their own private wells in their courtyards. One of the outer walls of the ovdan used to have a plaque identifying it as: "Medieval Ovdan. This monument of architecture is under the protection of the State." However, the plaque no longer stands. According to medieval sources, there used to be several underground tunnels located under the Old City. Some of them were constructed in the 15th century by the Shirvanshahs to serve as escape routes from the palace complex. Another underground tunnel was built by Gatir Haji Zeynalabdin at the beginning of the 20th century, connecting two of his residences: the one that used to stand where the Encyclopedia Building is now and another one located on what is now Aziz Aliyev Street where the Yin Yang Chinese restaurant stands. Haji wanted his family members to be able to move between the two houses, which were approximately 100 meters apart on either side of the citadel wall. My grandmother told me that she had often walked through this tunnel during her childhood. During the Bolshevik Revolution, the owners of these residences fled or were killed. Their buildings were subdivided into many small apartments, and the tunnels were forgotten until the 1970s, when archeologists rediscovered the tunnel, studied it and then went on to other projects, leaving their excavation work exposed. Somehow thieves figured out that the tunnel led right up into a jewelry store (now where the Yin Yang Restaurant is located). During the night, the thieves secretly began to dig and clean out this underground tunnel. Eventually, they succeeded in breaking into the jewelry store and ran off with some precious jewels. Once the Baku newspapers wrote about the crime, the tunnel was filled in. One of the Inner City's entertainment areas was the Zorkhana, a type of stadium where athletic competitions took place. Baku's Zorkhana dates back to at least the 15th century. Few people know about it, but this underground vault was located just a few steps from the Bukhari and Multani caravanserais, towards the Maiden's Tower. Similar to sports clubs today, men paid an entrance fee to participate in various competitions, including weightlifting, wrestling and boxing. There were contests accompanied by a trio of musicians who performed traditional Eastern instruments like the kamancha (stringed instrument), zurna (wind instrument) and naghara (drum). Most of these melodies have long since been forgotten. 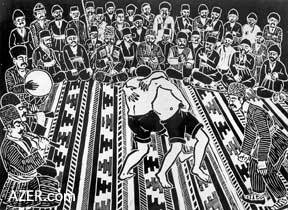 However, one by the name of "Jangi" (War) is still performed prior to the opening of national wrestling competitions (Gulash). Young men could test their strength against professional wrestlers such as those who came from Tabriz, Ardabil, Sarab and other cities of Southern Azerbaijan (in Iran). Sarabski writes about one wrestler nicknamed "Altiaylig Abdulali" (Six-Month Abdulali) who took on all these youth. Before each match, the famous musician Haji Zeynal Agha Karim would perform a song glorifying the wrestler. Altiaylig Abdulali would untie his belt, toss his hat on the floor and come out onto the stage grinning. The young amateurs approached him one by one. When Altiaylig was finished wrestling, the spectators would give him various denominations of money such as three, five or even ten rubles, a considerable sum of money at the time. The Zorkhana also functioned somewhat like a fitness club. When no competitions were taking place, men went there to do exercises and use sports equipment. Another competition involved lifting, hurling and catching heavy millstones. The event was referred to as "Mil Oyunu" (Millstone Game). The competitors were usually accompanied by a naghara player, who gradually increased the tempo by beating the drum faster and faster. Baku residents also enjoyed attending poetry readings (She'r Majlislari) and mugham sessions (Mugham Akhshamlari). Poets, musicians and others often gathered together to perform lyrical verses (rubai and gazals) and listen to mugham (Eastern modal music). Food, drinks and sweets were served. 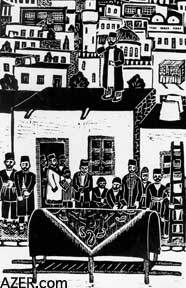 The residents of the Ichari Shahar were fond of "meykhana" (literally, wine house), an improvisational musical/literary form common to Baku and its adjacent villages. [See "Meykhana: Azerbaijan's Own Ancient Version of Rap Reappears" in AI 4.3 (Autumn 1996).] Meykhana competitions are still popular in the villages around Baku, although during the Soviet period they were banned for being too controversial. Meykhana takes its name from the Eastern pubs where these performances were carried out. The contest involved two or more poets exchanging verses back and forth in an extemporaneous fashion, sometimes joking and disparaging one another. Their rap-like songs often touched on social and political issues of the time. At the end of the contest, the audience determined which poet had improvised the most elegant and clever verses and declared him the winner. Another favorite pastime among the youth in Baku was raising pigeons. They would keep scores of pigeons in pigeon lofts, usually on the roofs of their homes. Every morning, the owners would climb up on the roof, feed the pigeons and then whistle loudly to send them off into flight. You can still find a few pigeon fanciers in the Inner City today. Nard (backgammon) was a favorite game in the Inner City. Every family had a set, and the men would often sit and play the game for hours. Some people also played shatranj (chess) and dama (checkers). Children played various games such as Chumrug-Chumrug, Besh-Onbesh, Usta-Shayird, Dash-Bash, Gizlanpach, Oghru - oghru, Shumagadar and others that are forgotten now. Of these games, only Gizlanpach (hide-and-seek) is still widespread today. Banovsha (Violet), known in other parts of the world as "Red Rover" or "Octopus Tag", was also a popular game in Ichari Shahar. The Inner City dwellers liked meat and often referred to it as "jan" (life). My grandmother once told me a funny proverb that divided various foods into categories according to their nutritional value and taste: "Go to the market and buy 'jan' (life, specifically meat); if 'jan' is not available, buy 'jarimjan' ('half-life', that is, eggs); if 'jarimjan' can't be found, buy 'badimjan' (eggplant, that is, 'poor man's food')". On holiday mornings, men met their friends in special cafes called "khashkhana". There they enjoyed "khash", a hearty, gelatinous soup made from calf's or sheep's feet and seasoned with vinegar and chopped garlic. Eating khash with friends was a popular activity back in those days, just as it is today in Baku. 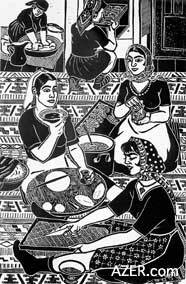 Certain dishes were typical of the Inner City and its adjacent villages: dushbara (soup made with tiny lamb dumplings), shorgogal (a round puffed cookie with salt and spices), and chudu, a puff pastry stuffed with minced meat and sprinkled with sugar and sumac). These dishes were typically not prepared in other areas of Azerbaijan. As far as traditional dress and appearance were concerned, each adult man had to wear a mustache and the national hat ("papag") on his head. Up until the early 20th century, it was considered shameful to appear in the street without a mustache, although Westernized citizens often infringed on this rule. When men were involved in a serious argument, they would threaten each other: "I'll cut off your mustache!" A man's hat is always on his head. The hat was considered to symbolize the man's honor. If someone touched a man's hat or grabbed it off his head, it was considered a great affront and could even result in bloodshed. Baku residents developed a set of traditions in regard to giving charity to the poor. During the Muslim religious holidays, the wealthy (and even those who were not so wealthy) would organize an "Ehsan", or charity dinner for the poor. It's not an Ehsan for you. Gochus were the bullies or gangsters of the Inner City. These glowering, pompous individuals sported big mustaches, dressed in national costumes and armed themselves with revolvers and daggers. When they walked through the city, no one dared confront them. The average person living in Baku came to fear them very much. Gochus appeared in Baku at the end of the 19th century, in response to the Georgian gangsters called "Kintos", who were engaged in kidnapping and robbery and threatened wealthy Baku residents. Since the city's police couldn't deal with the Kintos effectively, wealthy people began recruiting and arming strong, brave men. Soon, the Kintos disappeared from Baku, never to return again. The Baku millionaires saw the effectiveness of the gochus and began to use them as personal bodyguards. When the businessmen of the Inner City were involved in a quarrel, they often sent their gochus out to fight each other. Sometimes this resulted in a shooting match. It wasn't long until some of these gochu groups turned into a kind of mafia. Manaf Suleymanov wrote that a group of gochus kidnapped the famous Baku millionaire Agha Musa Naghiyev, who was known as a miser. The gochus demanded 10,000 golden rubles for his release and threatened to carve him up into little pieces. Agha Musa firmly replied: "I can pay only 950 rubles. Of course, you can cut me up into pieces, but then you won't get anything at all." The gochus understood that Agha Musa would rather die than part with his 10,000 rubles, so they released him for the ransom that he had negotiated. It's important to know that not all gochus were gangsters or killers or private security agents of millionaires. Some of them were rich young men who were simply bored at home. Seeking to have a good time, they would dress up in national costumes, wear daggers or revolvers and go out into the streets looking for an adventure, just to show their courage and strength. Usually, they ended up quarreling with each other and threatening the poor, helpless people in the streets. For example, they would approach a very poor man and cuff him on the head, saying things like: "How is it that you passed me by and did not address me by saying, 'Hello Sir?'" or "How dare you trim your mustache?" or "Where's your hat?" or even "Why do you stand in front of me with such a scowl?" There were also "good gochus" who protected their communities from criminals. Curiously, it was the gochus who helped save the Inner City during the Armenian and Bolshevik massacre of March 1918, as they were primarily the only armed and organized Azerbaijanis in the city at that time. Businessman Teymur Ashurbeyov, who lived in the Outer City, and Mammad Hanifa Taghiyev from the Inner City mobilized their gochus, and then rallied and armed many other citizens. They sent these troops in against the Armenian Dashnak military forces. As a result, the Inner City and a few streets of the Outer City were spared from the massacre, while thousands of other Azerbaijanis were slaughtered elsewhere. There used to be a very large, old mulberry tree in the Inner City, located behind the Juma Mosque. People believed that it was several hundred years old. On hot summer days, men would sit under it drinking tea and playing backgammon. The tree was such a well-known landmark that people used to say things like: "Let's meet at the Mulberry Tree" or "I live to the left of the Mulberry Tree." A popular song was even written about this tree as a symbol of the Inner City. About 25 years ago, the tree was cut down when some construction work was being done. The local people were very upset about this loss. Several months later, someone decided to plant a new mulberry tree there. Back then, Baku residents cared about their city and wanted to maintain its historical look and landmarks. But now, the new tree has been cut down, too. There are simply not enough of the native residents of the Inner City remaining there who understand its significance. The history of the Inner City during the first Oil Boom (1850-1920) is extremely rich and engaging. The memories of Huseingulu Sarabski, Manaf Suleymanov, as well as the stories of the elder Inner City residents, the old newspapers and magazines, and many other sources reveal interesting facts about the history of Baku. These details must be carefully collected, reconstructed and investigated by today's historians. Now that the Soviet period has ended, we have the enormous task of researching the history of our nation and trying to set the record straight. Dr. Farid Alakbarli, a frequent contributor to Azerbaijan International, is chief scientific officer in the Department of Arabic Manuscripts at Baku's Institute of Manuscripts. His speciality is researching Azerbaijani manuscripts written in the Arabic script. To read other articles by Alakbarov, SEARCH at AZER.com. Several of his articles may also be found in Azeri Latin at AZERI.org, a Web site that features Azeri language and literature.